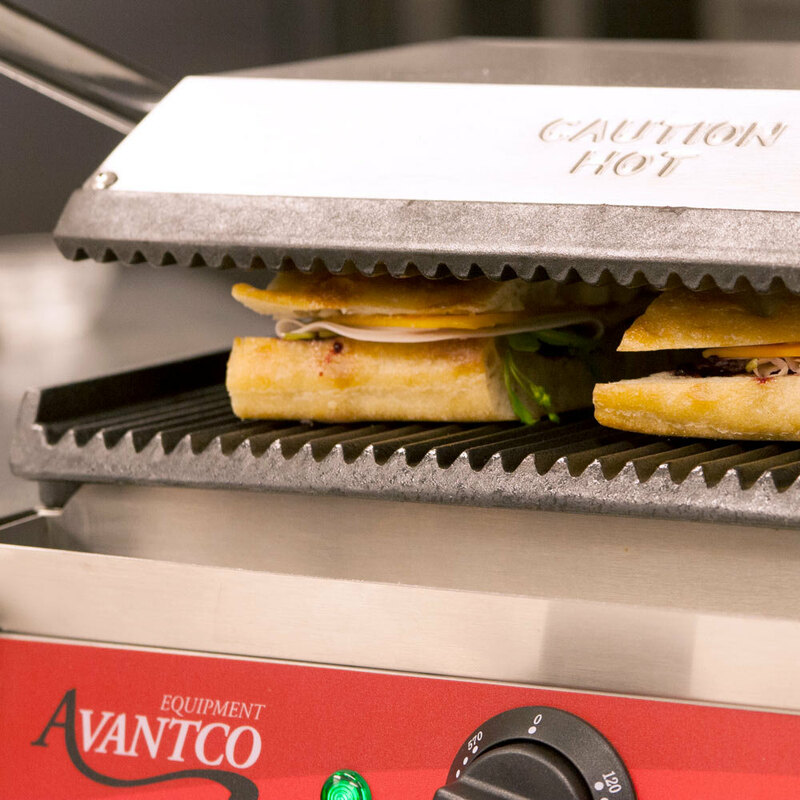 Create your most popular sandwiches, quesadillas, hamburgers, and more with the Avantco P78 grooved commercial panini sandwich grill! 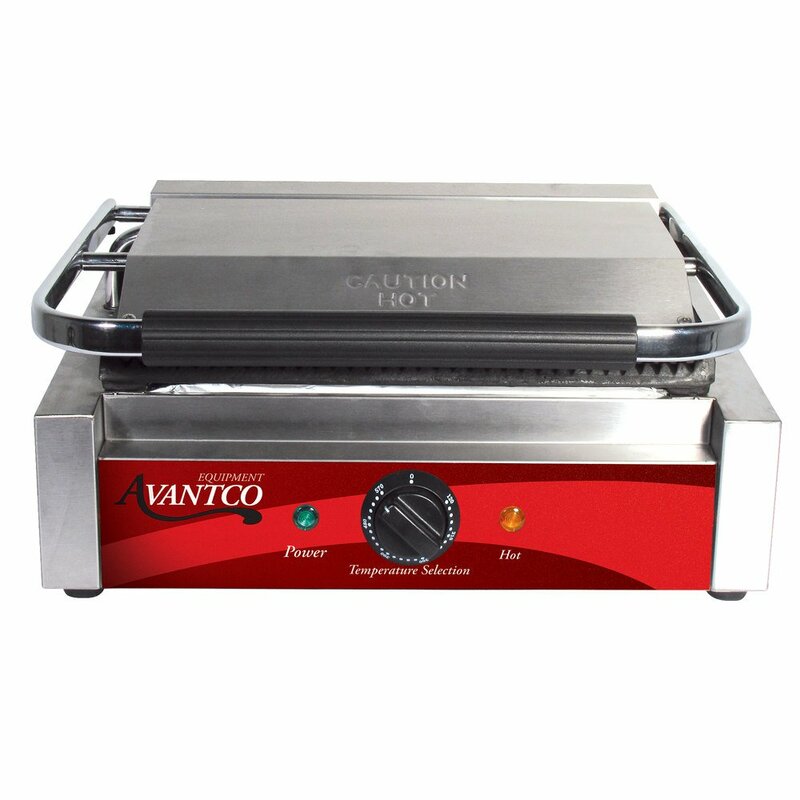 This sandwich grill features 1750 watts of heating power for fast and thorough cooking, and its grooved grill plates provide tantalizing grill marks for an excellent presentation. The temperature is easily adjustable between 120 and 570 degrees Fahrenheit to cook or warm a wide variety of foods, while the stainless steel exterior and cast iron plates ensure long-lasting durability and strength. And thanks to the included drip tray, cleaning up is a breeze after every use. Upper Plate: 13" x 8 3/4"
Lower Plate: 13" x 8 3/4"
I have not had this grill long, but it has out-performed my expectations. For an inexpensive grill it works great. The handle is a bit stiff AND there is a learning curve with regard to where to put your sandwiches, but overall the heating is very even. Erin R. from FC LLC. This panini press produces the perfect panini. 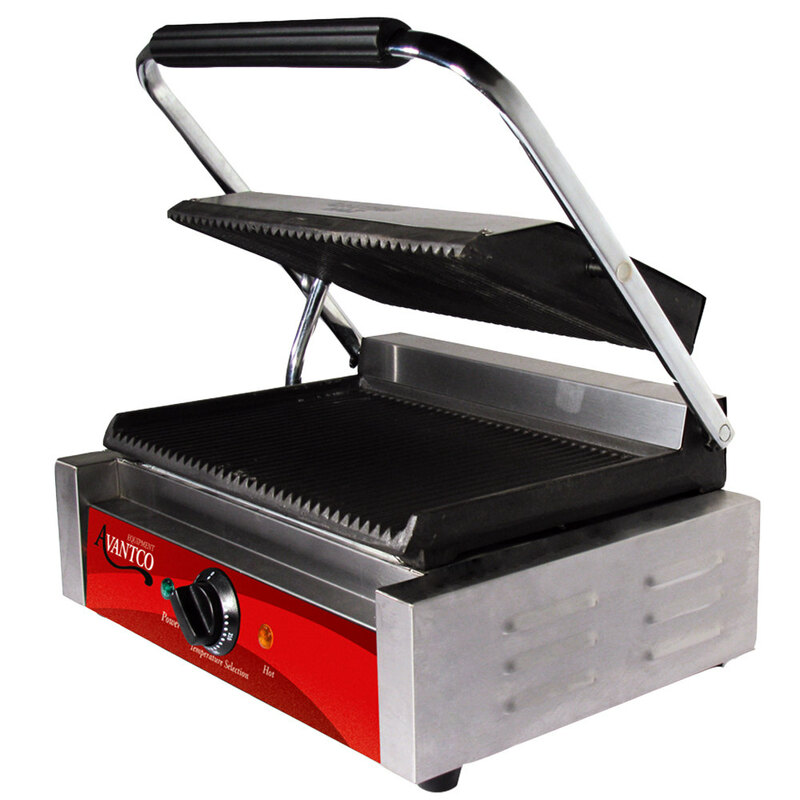 Creates grill marks, and evenly toasts the bread, melting cheese all the way through. Love this product and highly recommend. Very nice product. i recommend it. It handles well heavy duty tasks, keeps the temperature and the size is good for the place I have (40 seats). Make nice paninis!! Easy to clean as well, which is great! This is a good panini grill but it is not the easiest to use. It takes a while to heat up the grill and it is difficult to open up fully to put a sandwich in. As a Cuban Food business we are expected to prepare Cuban Sandwiches and this beautiful grill will help us to it. The measures are just perfect, it is easy tu use / clean and it warms really fast. I loved it! We will recommend it! Perfect size for my coffee bar counter for making a quick panini. Made of sturdy quality feels very hefty and does the job perfectly. Heavy top. Feels good in the hands. I looked everywhere for a good panini machine and this is it , really good price easy to clean and it reaches the desired temperature quickly and it hold it perfectly . i highly recommend it . Works great for our small cafe. Doesn't take up too much space either. Heats up our sandwiches in about 3 minutes! People love panini sandwiches! Simple, easy to use and convenient for making a quick Panini Sandwich. Just what my wife needed for her cafe. She is using it as the second Panini Grill. Perfect Panini's all day long! 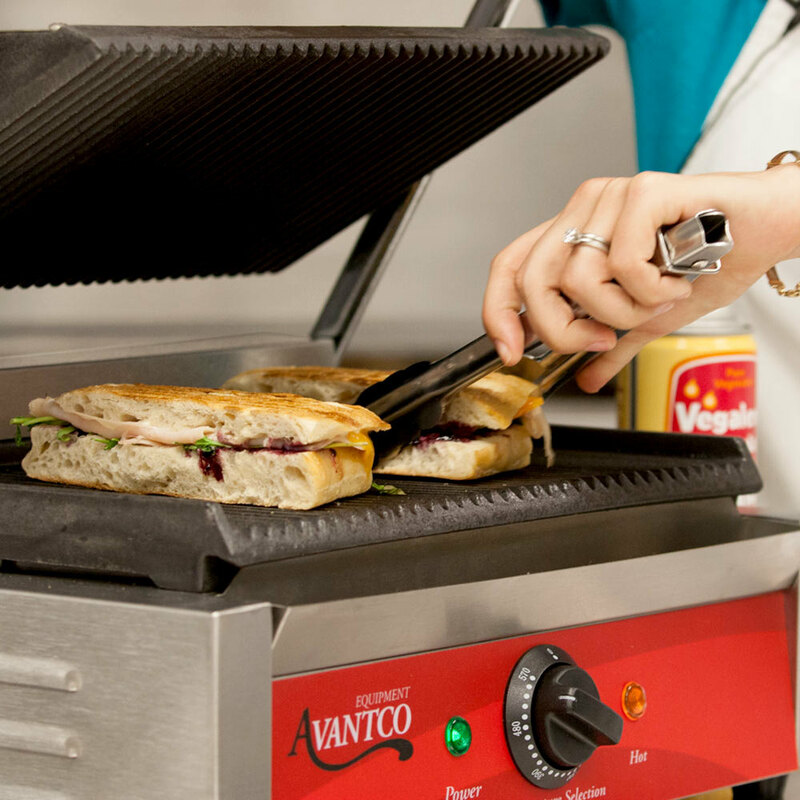 The Avantco P78 Grooved Commercial Panini Sandwich Grill - 13" x 8 3/4" has the perfect grilling area and heats up quick to serve perfect grilled sandwiches. This guy was cheap and it heats our burritos like a champ. It makes a slight clicking sound as it cycles the element on and off, so I don’t recommend it for bedside service, but it seems to be built like a tank otherwise. Excellent panini sandwich grill. With a little bit of oil, sandwiches crisp up nicely and have the beautiful crisp lines. Will be adding a couple more to the kitchen soon. We have been using this panini press for well over two years and it only gets better with age. Our paninis are perfectly seasoned and taste delicious! So far so good, we've had this panini press for a few weeks. Aggressive sandwich press, the plates are nice and hot. Equipment gets to temp fast, easy to clean, seems to be very durable and handles the volume with no issue. 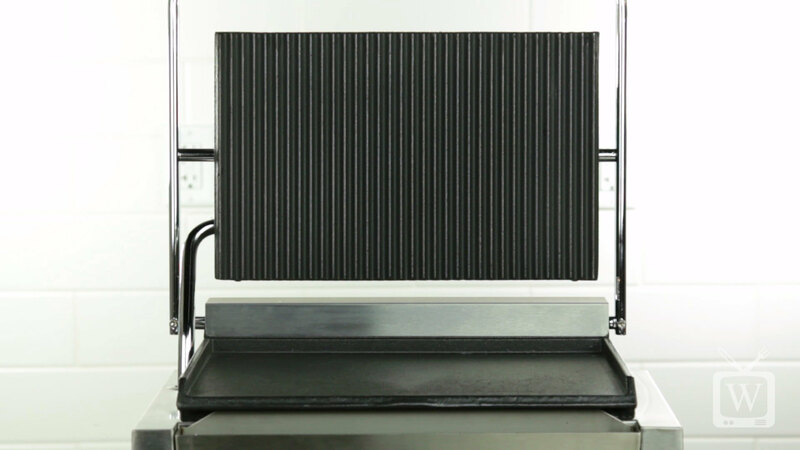 This is a wonderful sandwich press, the only problem is cleaning it and also within a year of having it in our kitchen, we had to replace the element in the unit. I prefer this unit over my double panini press, these pressed work well, however they are not the easiest to clean. I stiff wire brush is need to scrap out the grooves. Really good panini grill. This unit has proved very rugged and reliable. It is equal in quality to any of the more expensive panini units. We serve a wide variety of sandwiches at our deli, and some of our most popular options are our paninis. We use they grills to make all of our paninis and we've used them for a very long time with no problems whatsoever. 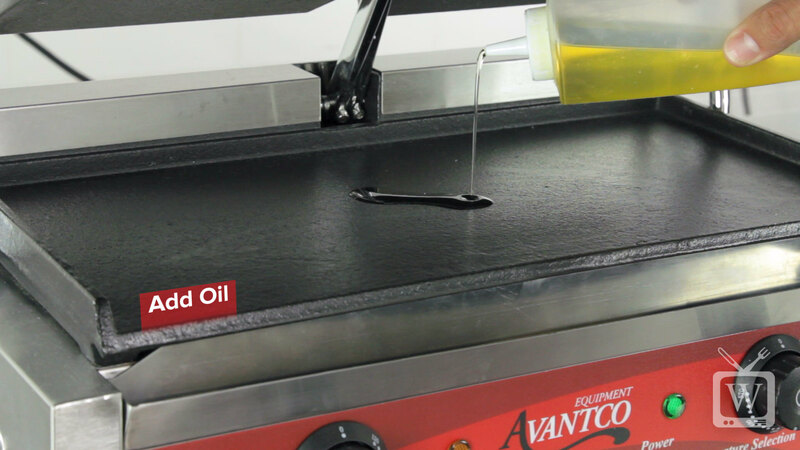 Avantco Grooved Commercial Panini Press is great for concession trailers and mobile kitchens. These Units are built well and generally stand the test of time. These work great. I own 2 of them for my sandwich shop. Can heat up to 4 sandwiches at a time. Last a long time. Great deal! This Panini Grill is planned for expanding our menu, so we were not planning on spending as much for a product that we are going to try out. It is heavy duty. So far so good with our panini grill. Heavy duty with cast iron plates. Food will stick at first, but over time I know they will be stick resistant. This is a very heavy-duty item for the price. And the fact that you're given all possible choices regarding plates (flat or grill) was a big plus in our decision making. This is a very good and reliable commercial sandwich grill. I use it every day and every time it makes very nice grilled sandwiches. It is number one. This machine works like a charm. it makes the perfect Paninis and sandwiches. It really keeps up with needs of the business. I wish I had purchased a bigger one. its GREAT!!!!!!! We've used this several times in the few days since we've got it and the panini's are absolutely perfect. It has made very ordinary sandwiches special.